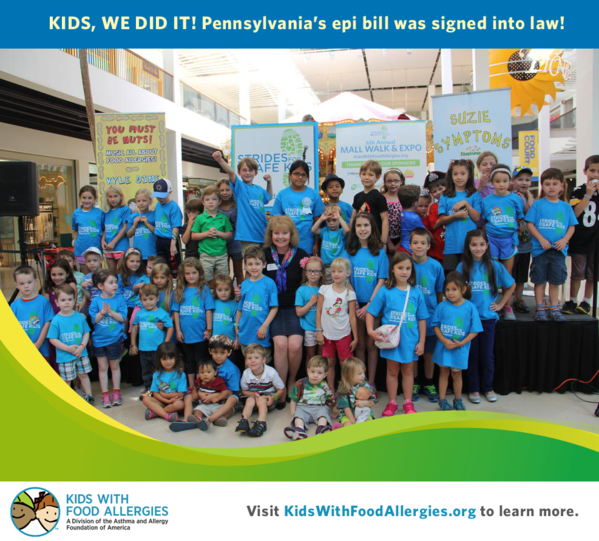 (Doylestown, PA) – The Asthma and Allergy Foundation of America (AAFA) today applauded Pennsylvania Governor Tom Corbett for signing legislation that allows Pennsylvania schools to protect children and adults from potentially life-threatening allergies. House Bill (H.B.) 803 permits schools to maintain a supply of epinephrine – a medication proven to slow the effects of a severe allergic reaction (anaphylaxis) – and directs these schools to designate and train school employees to administer the medication in an emergency. H.B. 803 updates Pennsylvania law, which previously did not allow schools to store epinephrine for emergency use and did not protect school employees from liability if they administered the medication. While students with known allergies could carry and self-administer epinephrine, students with undiagnosed allergies and those without their own epinephrine were unprotected. According to CDC guidelines, 16 to 18 percent of children with diagnosed allergies have experienced a reaction at school, and 25 percent of all reactions experienced at school involve children with previously undiagnosed allergies. Anaphylaxis is the most severe form of allergic reaction, which can be triggered by allergies to certain foods, medications, latex or insect bites and stings. Symptoms include severe hives, swelling that can block airways, other breathing problems such as asthma attacks, or even a significant drop in blood pressure. Epinephrine is the medication indicated by medical experts as the only first-line treatment for these types of severe allergic reactions. With prompt use, epinephrine is highly effective at treating anaphylaxis, and any delays in use can increase the risk of poor outcomes and even lead to death. Epinephrine auto-injectors are easy to use, quick to administer and low-cost to maintain adequate supplies. The facts are simple: when available and used appropriately, epinephrine auto-injectors can save lives. Founded in 1953 and celebrating over 60 years of service, AAFA is the oldest and largest nonprofit patient organization dedicated to improving the quality of life for people with asthma, allergies and related conditions through education, advocacy and research. AAFA provides practical information, community-based services, support and referrals through a national network of chapters and educational support groups. AAFA also sponsors research toward better treatments and a cure for asthma and allergic diseases. For more information about AAFA, visit www.aafa.org. Kids With Food Allergies (KFA) is dedicated to keeping children with food allergies safe and healthy through education about prevention, care and treatment, until a cure for food allergy is found. KFA is an essential part of the food allergy and anaphylaxis community offering free patient education programs, webinars, an allergy buyers’ guide, an electronic database of allergen-free recipes and more. KFA hosts the largest and most active online food allergy and anaphylaxis community, a critical platform for parents and caregivers who want to network with others about raising kids with food allergies and related diseases. KFA became a division of AAFA in 2013. For more information visit www.kidswithfoodallergies.org.